Ealing Council has announced the creation of ‘cycle hubs’ as part of its Cycling Strategy for the next five years. The strategy aims to encourage more people to take to two wheels as their regular mode of transport. As one of Transport for London’s Biking Boroughs, Ealing Council will focus on creating a local culture of cycling and will introduce town centre locations known as cycle hubs. Hubs are areas where innovative ideas for cycling can be piloted and where resources can be targeted to increase cycling. 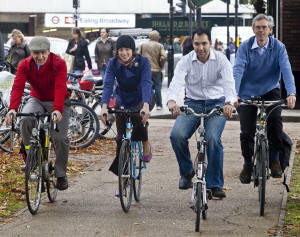 Ealing’s new hubs will be located in areas with a high concentration of cyclists. Lighting and bike parking will be improved to increase convenience and security. Ealing Broadway, South Acton, Southall Broadway, Elthorne, Northolt and Greenford have all been identified as potential locations for the hubs. The council will now work with key stakeholders to develop the cycle hub concept further. "Ealing Cycling Campaign welcomes the innovative cycling strategy from Ealing Council and looks forward to working with the council in delivering the vision." The hubs will be created with funds from TFL’s Local Implementation Plan. You can find out more about cycling in Ealing at: http://www.ealing.gov.uk/services/transport_and_streets/cycling and www.ealingcycling.org.uk.